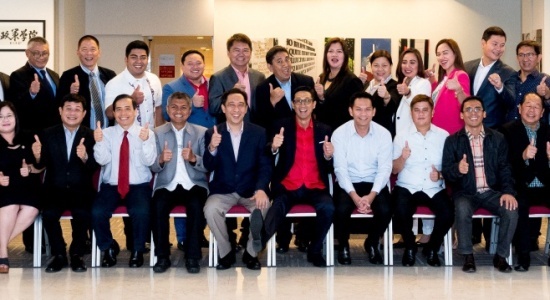 The group is shown in a light mood with DAP officials and officials of the host school during a break in the five-day training – called “Driving Excellence in Governance” – at the National University of Singapore’s Lee Kuan Yew School of Public Policy. Thirty-three delegates from the League of Vice Governors of the Philippines (LVGP), headed by its national president, Isabela Vice Governor Antonio Albano, and its chairman of the board, Oriental Mindoro Vice Governor Humerlito Dolor, recently attended the foreign study “Driving Excellence in Governance” at the National University of Singapore’s Lee Kuan Yew School of Public Policy (NUS-LKYSPP). The foreign study, which is the academic visit phase, the second phase of the project funded under the General Appropriations Act, was overseen by the Development Academy of the Philippines, which was commissioned by the LVGP to conduct the entire project and then engaged the NUS-LKYSPP to design and implement its second phase. Representatives from the NUS-LKYSPP that met with the participants included Associate Dean Donald Low, Vice Dean (Research) and Associate Professor Eduardo Araral, Associate Professor Vu Minh Khuong, and the Executive Education Department’s Head of Programmes McRhon Banderlipe I. The DAP secretariat, on the other hand, was headed by Senior Vice President for Programs Magdalena Mendoza. The activity is the first executive program at the NUS-LKYSPP participated in by a full Filipino delegation.